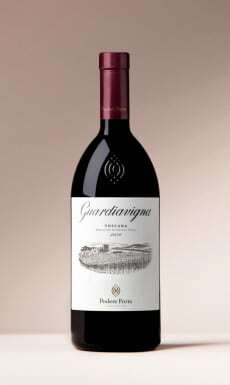 Guardiavigna is a Cabernet Franc based Bordeaux blend, which adds a Tuscan soul to its classic, French structure. Thanks to its rich fruit, we're enjoying this complex wine in its youth, but we will worship it when aged to perfection. Guardiavigna is one of the best kept Super-Tuscan secrets. Yeah, yeah, we are aware that the term “super tuscan” is as modern as analogue telephones, but if you remove the wool from your eyes, you will realize that this Cabernet Franc based blend is pretty unique. This wine carries a true Tuscan soul, with a balanced influence from Bordeaux. Perhaps thanks to its Demeter Certification, Guardiavigna is more naked in its Terroir expression compared to most other pedigree Bordeaux-blends from this area. We adore it!